Bluerank agency has managed a SEO project for markt.de website for 6 years. 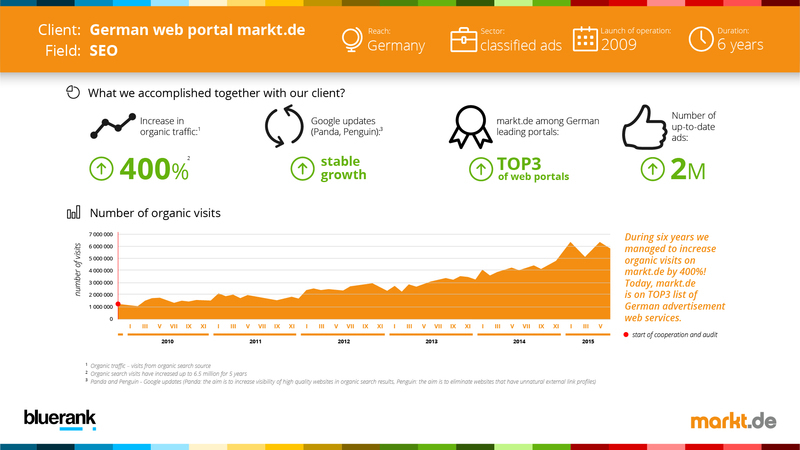 Thanks to our fruitful and long-term cooperation, the organic traffic of markt.de increased five times. The key to success was a meticulously planned SEO campaign and a thorough training for markt.de personnel, which resulted in establishing a qualified SEO department on the client side. Markt.de is a German advertising website with about 2 million active ads. Anyone can add free classified advertisements and find offers from various fields, i.e. automotive, wedding, animals, studies and more. Markt.de is visited daily by half a million users, which results in 100 million page views per month. At first, our agency performed SEO visibility audit and then supported markt.de in the scope of optimization recommendations and regular consultancy. Our goal was to increase the number of advertisements added by the users on the web service, to increase traffic despite a highly competitive market environment and to find a solution to problems as far as indexing and content duplication are concerned – states Jacek Tkaczuk, SEO Director at Bluerank. Furthermore, Bluerank experts provided a professional supervision in the scope of SEO for markt.de team for over 6 years. Thus, our client managed to create a qualified department which gradually became responsible for implementation of the recommended strategy. With full conviction we can recommend Bluerank as a reliable and competent business partner. The Agency has demonstrated a very good understanding of our strategy and achieved extraordinary results, providing us additionally with expert support at the highest level – Said Clemens Henle, Clemens Henle, Chief Operations Officer, markt.de, GmBH & Co. KG. Managing the project for markt.de let Bluerank gain comprehensive experience and know-how on classifieds in C2C and B2C categories.